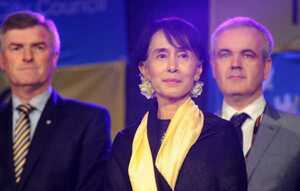 Amnesty International has withdrawn its Ambassador of Conscience Award from Aung San Suu Kyi “in light of her shameful betrayal of the values she once stood for”. 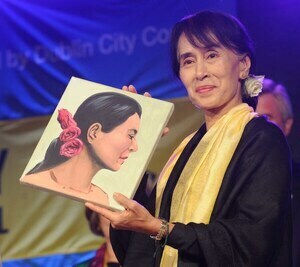 Last year, Dublin City Council stripped the Myanmar leader of her Freedom the City of Dublin award following her indifference to the persecution of her country’s Rohingya people. 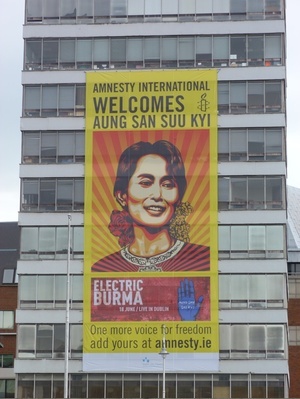 Yesterday, Amnesty International’s Secretary General Kumi Naidoo wrote to Aung San Suu Kyi to inform her the organisation is revoking the 2009 award. 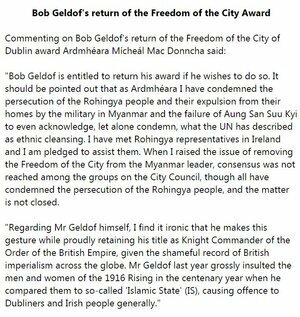 “When we honoured Aung San Suu Kyi here in Dublin, it was for a Myanmar that would protect and defend the human rights of all. 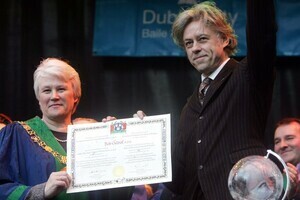 This is what Irish people in their tens of thousands had campaigned for decades to achieve. We will continue to fight for justice and human rights in Myanmar – with or without her support. Posted in Misc and tagged Amnesty International ireland, Aung San Suu Kyi at 5:33 pm on November 12, 2018 by Bodger. Further to reports that more than 420,000 Rohingya Muslims have fled violent attacks by Buddhists in Myanmar. We are into the second week of this but finally a European leader has called this for what it is [French President Emmanuel Macron has said attacks on Myanmar’s Rohingya minority amounted to “genocide]. it is now time to rescind Aung San Suu Kyi of ALL the honours she picked up on her Bono-led tour of Ireland We cannot and should not honour apologists for genocide. 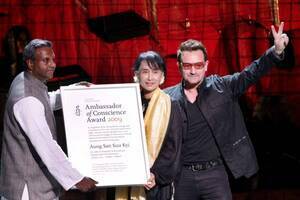 Posted in Misc and tagged Aung San Suu Kyi, Bono at 4:30 pm on September 21, 2017 by Broadsheet. 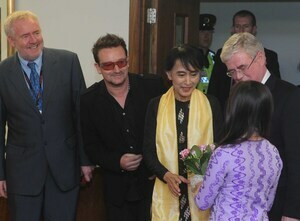 The Electric Burma Concert in honour of Aung San Suu Kyi with from top left, Dublin City Manager John Tierney and Colm O’Gorman, of Amnsesty International Ireland; Bono and Amnesty International Secretary General Salil Shetty; a portrait gift; Bob Gedof and Jeanne Marine; Actress Joely Richardson, Amnesty ambassador, Aung San Suu Kyi outside the Grand Canal Theatre; children from the Waterford Burmese community, from left Jessica Min, July Thedmaung and Thomas Aund; Dhinzar Smway and her son Lia. 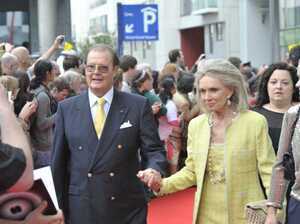 Actor Roger Moore, a UNICEF ambassador and Christina Tholstrup. 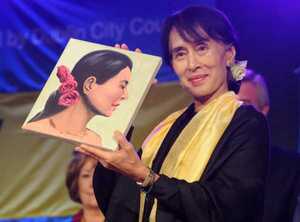 Posted in Misc and tagged Aung San Suu Kyi at 12:00 am on June 19, 2012 by Broadsheet. 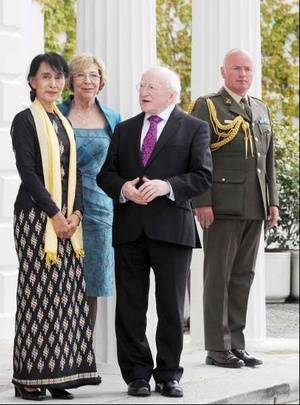 Aung San Suu Kyi (and her son, Kim Aris, this pic far left), welcomed to Aras an Uachtaráin by President Squee and Sabina within the last 30 minutes. Posted in Misc and tagged Aung San Suu Kyi, President Squee at 5:53 pm on June 18, 2012 by Broadsheet. 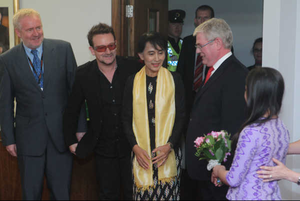 Aung San Suu Kyi at Dublin Airport with Bill Shipsey (top left) of Amnesty International and Bono and Eamon Gilmore literally minutes ago. Posted in Misc and tagged Aung San Suu Kyi at 5:24 pm on June 18, 2012 by Broadsheet. 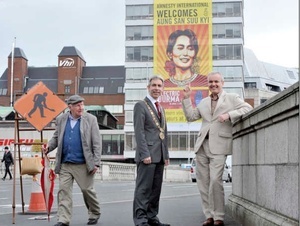 Colm O’Gorman, chief executive of Amnesty International (right) with Andrew Montague, Lord Mayor of Dublin, and a bemused passer-by at the launch earlier of a 20-metre banner welcoming Burmese democracy leader Aung San Suu Kyi ahead of her arrival in Dublin on June 18. Posted in Misc and tagged Aung San Suu Kyi at 2:08 pm on June 12, 2012 by Broadsheet. 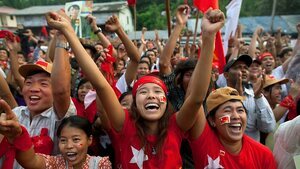 How Happy Are They In Burma? Posted in Misc and tagged Aung San Suu Kyi, Burma at 8:07 am on April 2, 2012 by Broadsheet.